I went and installed Ubuntu 9.04 (Jaunty Jackalope) onto my test system as a dual boot with Windows 7 Release Candidate, and so far so good. This was the same system I had installed OpenSUSE 11 on before and I went back and reviewed how I tweaked my desktop there and did very similar setup for the Ubuntu setup. I installed Cairo-Dock, and included launchers for Firefox, Thunderbird, Terminal, BitTorrent, and OpenOffice Word Processor. As part of installing Cairo-Dock, I eliminated the botton toolbar and merged its contents to the top toolbar. I also played around some with Gimp (v2.6 comes with this version of Ubuntu) – the Jackalope pic with the Ubuntu logo merged into it was the result. I also installed Screenlets and setup clock, calendar, slideshow, weather, and system info screenlets to launch upon login. As expected, Thunderbird was just as easy to setup for imap to my gmail account as it was in Windows. So those are my first notes for this version of Ubuntu. As I play with it more and find things noteworthy, I’ll post those. 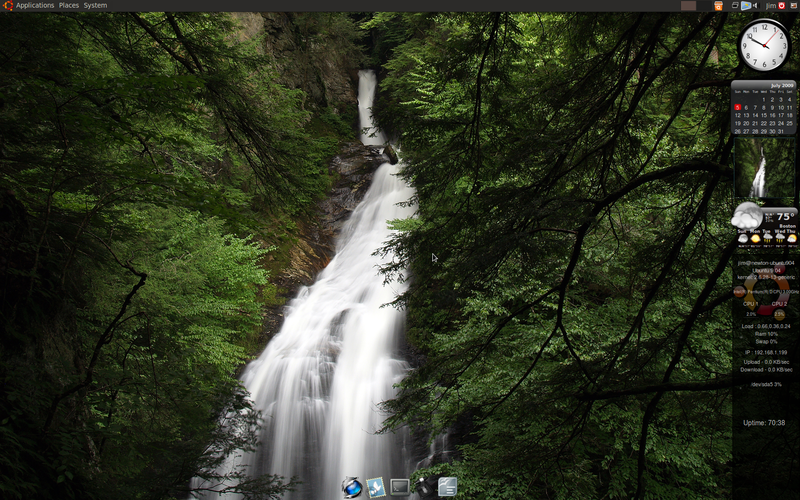 Screenshot of my Ubuntu Desktop.